The problem of reciprocal torque is inherent to a conventional steam locomotive’s design, and was recognized as a performance-limiting factor early into the 19th century. In 1890, a Frenchman named John Jaques Heilmann patented a locomotive design that used a traction motor rather than pistons, thus eliminating the problem of torque. Heilmann’s design was a stark departure from the typical form of a typical steam locomotive. The boiler was small and mounted towards the back of the engine. It fed steam to a small steam engine that powered a generator, which in turn electrified a traction motor. Heilmann built two prototypes in 1892, and covered with smooth casing forty years before streamlining came into vogue. While Heilmann’s locomotives were not the first electrical locomotives constructed, they were the first workable prototypes that did not need to be wired in to an existing electrical network. Their range was not constricted to the very limited electrical network of the 1890s. The two Heilmann prototypes performed satisfactorily during testing in 1894 on the Chemins de Fer de l'Oues line out of Paris. 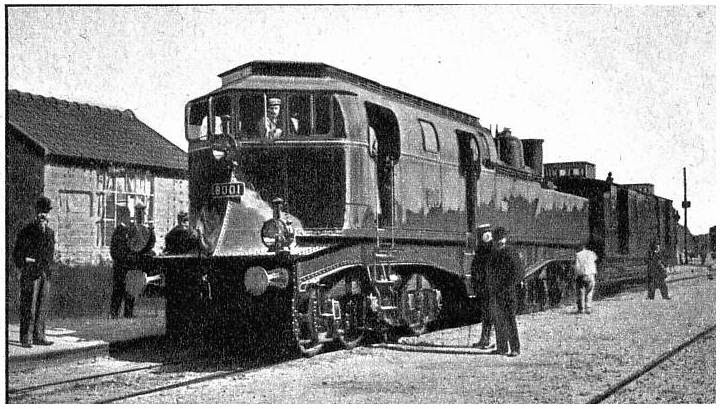 The most prominent criticism of the Heilmann locomotives was that the design separated the engineer and fireman in the same way as a Mother Hubbard type locomotive. Heilmann also intended for the locomotive to run with a crew of three, though he may have erred on the side of caution in regards to the relatively new electrical technology. A number of railroad companies in Europe and the United States expressed interest in purchasing Heilmann’s locomotives. None of them followed through, though, and steam-electric traction never caught on despite its promising results. Ironically, the first generations of gasoline and then diesel powered locomotives borrowed heavily from the Heilmann’s steam locomotive design. One of the unusual design features of the Heilmann locomotive was that it placed the cab in front at the front of the engine. This solved another problem that was inherent to a conventional steam locomotive’s design: The boiler limited the crew’s ability to see in front of them, especially when going around tight curves. True cab-forward tender engines were not possible until the invention of oil-fired locomotives, since wood and coal burning locomotives required the fireman to be close enough to the fuel supply to manually supply the fire. Oil, as a liquid, could be piped wherever it as needed and allowed the typical locomotive’s design to be rearranged. Placing the cab at the front of the engine had the immediate benefit of allowing the crew members far greater visibility, and also kept them better shielded from the smoke exhausted from the fire. The downside was that the oil lines were longer and had to be routed near the running gear. At the least, this arrangement required more maintenance. At the very worst, it presented a severe hazard to the crew: There is at least one documented case of cab-forward crew members loosing their lives after oil leaking from the oil pipes was set on fire by heat and friction fromt he drive wheels. Cab forward locomotives saw only limited us in Europe and the United States. The best known models were those produced by the Southern Pacific in the 1940s. There are exceptionally few examples of tank engines designed to run cab-forward. It was more common to mount a cab on both end or run two boilers out of one cab, as in a Farlie-type locomotive. As freight haulage demands went up, so too did the need for stronger motive power. Railroad managers preferred to avoid double-heading wherever possible, as this doubled the size of the crew required for one train. Locomotive builders responded by increasing the length and girth of the average locomotive’s boiler, but eventually, began to run into limitations. A locomotive’s firebox could only be expanded so much before it no longer fit around the locomotive’s frame, and the longer a locomotive’s boiler was, the more trouble it had fitting around curves on the tracks. One answer to this problem was the Mallet locomotive, and articulated locomotives, in which the frame hinged and allowed a large, rigid boiler to fit around curves in the tracks. This design saw significant use in North America and Europe. Another response these challenges was the Garratt type of locomotive. Instead of continuing with the traditional boiler-forward profile, this design suspended a boiler in a “cradle" between two separate steam engines, one in front and one in back. The locomotive was hinged into three separate sections, allowing it incredible flexibility and a much more graceful effect on the tracks. The boiler-in-center design also provided crew member with better visibility, particularly when running backwards, since they did not have to look over a tender. Furthermore, because each set of pistons received fresh steam, instead of one pair using already cycled steam as in a compounding piston design, a Garratt locomotive essentially did the work of two locomotives, without requiring an additional crew. 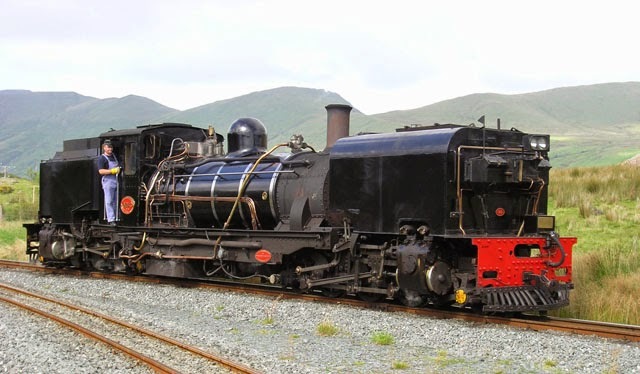 It isn’t quite fair to say that Garratts locomotives never caught on, as is the case with the other examples listed here, since they were used in great numbers in Africa and Australia. What is notable about Garratt locomotives is that they never had a chance to live up to their full potential before steam fell out of favor. Since the boiler was slung low and was not constrained in size by the frame and drive wheels, theoretical later generations could have expanded the boiler’s size and power far beyond what was feasible in a conventionally designed locomotive. Garratt type locomotives also warrant mention because they were never used in North America, even though the they functioned best in geographic conditions similar to the American Southwest and might have performed better than the problematic compounding locomotives being used at the time. Pennsylvania Railroad s2. A/N: This replaces an earlier image that had been photoshopped. There are two types of locomotive that fall under the category of “turbine locomotives." The first type, a steam turbine(pictured above), is similar to the design of a conventional steam locomotive, except that the steam is routed to a turbine instead of pistons, which uses gears in place of running gear to turn the wheels. A steam-turbine electric (pictured at top of article) functions the same way as the Heilmann locomotives mentioned above, except that a turbine, not a small piston-engine, powers the generator. Steam turbine locomotives of both varieties produced ambivalent results. 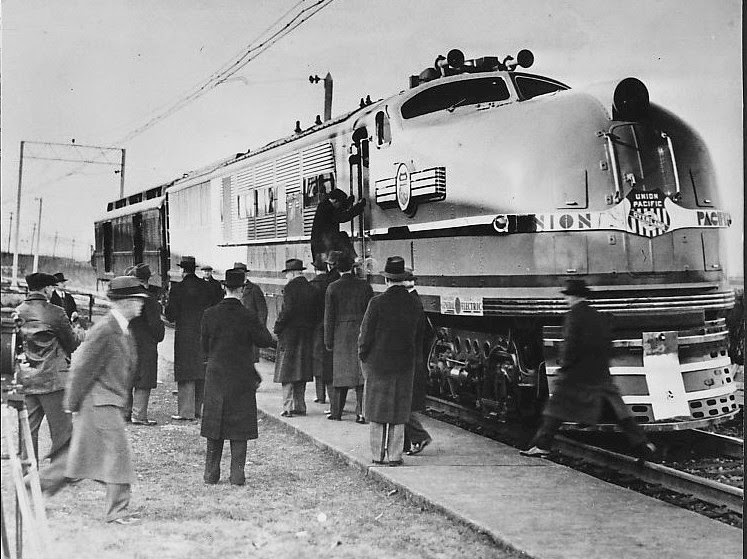 The design removed the torque problems that conventional locomotives experienced at low speeds, and some models were very efficient at high speeds. However, the turbine was markedly inefficient at low speeds, and designing a way for a turbine-driven locomotive to travel in reverse was far more complex than with a piston-driven engine. In some models, the delicate turbine components had difficulty holding up in everyday operating conditions. Several different European countries experimented with turbine locomotives during the 1930's and 40's. Few survive to the present day, as most were destroyed during World War II or converted back into more reliable piston locomotives. Several railroad companies in the United States also experimented with turbine engines. Their results produced some of the largest and most powerful locomotives ever created, but none saw significant general use. Turbine technology held the potential of significantly improved results compared to conventional designs, but it arrived too close to the end of steam to be developed beyond the prototypical stages. above the drive wheels, and the condensing coils are visible on the tender. A typical steam locomotive vents steam through the smokestack after it has been cycled though the pistons. This requires the locomotive to periodically take on water--more frequently, in most cases, than it must be refueled. A condensing locomotive recycles all or part of the water that would otherwise be vented into the atmosphere. The first locomotives designed to condense exhaust steam were designed for use on the early London Underground, before electric locomotives became a viable alternative. The designer’s goal, in this case, was more to cut down on emissions that would have clogged the inside of the tunnels than to increase the locomotives’ range. These early condensing designs were less than satisfactory. The condensers could only cool the exhausted steam to slightly below the boiling point, and injectors used at the time could only function with cool water. The water still had to be replaced fairly frequently, but at the time the condensing locomotives worked well enough to be used in early subways and steam trams operating in urban areas. Operating a condenser in order to lower emissions required the locomotives in which it was installed to operate at a lower speed, which was not acceptable to freight locomotives. Condensors in commercial locomotives did not start to be installed until the latest generations of steam and the technology had had the chance to be developed more thoroughly in other sectors. Even so, condensers required a tradeoff. The design of any steam locomotive requires a draft in the smokebox--if the exhaust steam was removed, then a fan had to be added instead. This mechanism, and the condensers themselves, would draw away some of the steam that would otherwise be used for tractive effort. The point of a condensing locomotive, therefore, was not so much an increase in power, but in water-imposed range limits. Consequently, they tended to appear in very arid climates. South Africa, again, experimented with condensing locomotives and produced some with an estimated range of 500 miles before more water was required, but the condensing apparatus and in particular the fan blades were quite difficult to keep in working order while on the road. As with the turbines, the technology showed great promise, but came too late in the waning age of steam to see any significant use. *A steam-electric engine is not to be confused with an electric-steam engine, in which electric heating coils placed around the boiler provide steam instead of an open fire. Electric-steam engines were conceived and used in moments of desperation where more conventional fuels were not available--most notable, Switzerland during the World Wars--and were so inefficient that they were never seriously proposed as an alternate power source.